I felt pretty good about teaching Eloise and her cousin Lucia how to ride bikes without training wheels this summer. It was hours after that exact moment that Wendy and I turned at each other and said something like, “Crud. Now we have to get bikes, too!” The last time I had a bicycle was in second or third grade, and it had a banana seat and coaster brakes. Never evolved beyond that and never got into Midnight Ridazz, fixies, or anything. But just like that we went from zero to three bikes in our household and have become regulars on the L.A. River Bike Trail. 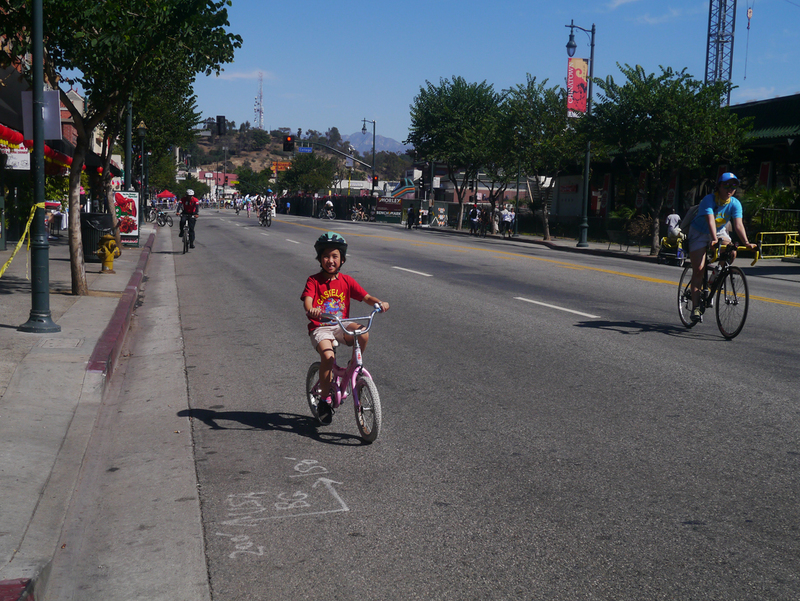 Today we went on our first CicLAvia ride, in which streets are shut down so cyclists can explore enjoy the city in a car-free environment. 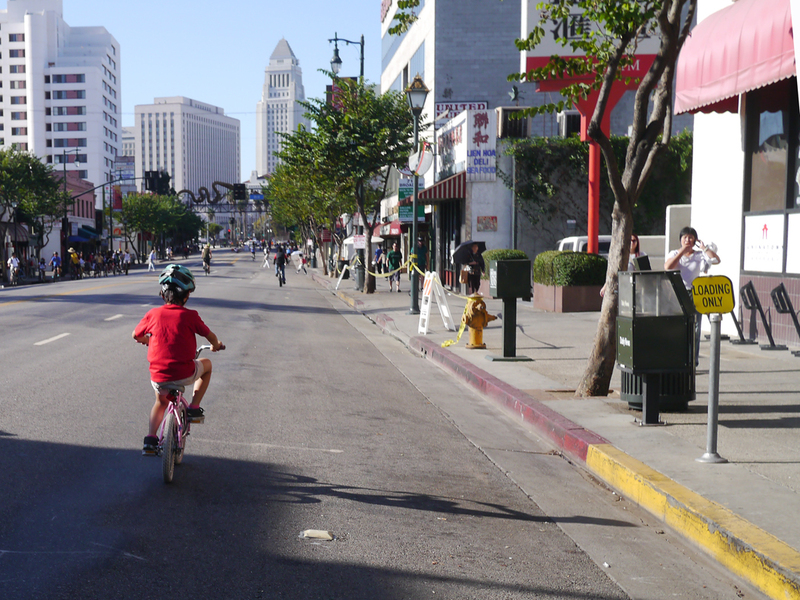 I think the idea is to get Los Angelenos out of the house, on their bikes, and into new neighborhoods, but we just visited the same Chinatown and Downtown streets that we drive through practically every day. Of course, it’s different on a bike going through the 2nd Street tunnel and Eloise had never been to Grand Central Market. Meanwhile, I had never been inside the Bradbury Building. 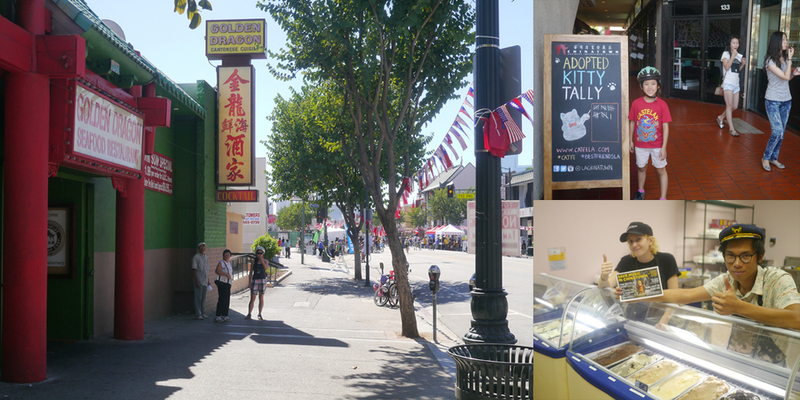 The mercury reached 97 degrees, so we turned around after slugging some watermelon agua fresca and taking pictures in the legendary Blade Runner setting, and headed back to Chinatown. Eloise is a tough little kid but she’s still just a little kid and was toast. Back in Chinatown we stopped by the Catfe to see the felines resting up for their last afternoon at the crowded pop-up and then made sure Scoops had enough Save Music in Chinatown benefit flyers for the week. After all that, Eloise’s favorite part of the day was us meeting my in-laws for dimsum. The next CicLAvia event is in December in South Central. Will we see you there? Although I’m not quite buying into those tight biker shorts or flippy little caps yet, we had a very cool day.